Moderators: This thread is intended for the Reviews forum. The Fenix LD20 is a 2-AA powered, Cree XP-G based flashlight. I've been using this light for almost 18 months, and while this light has been superseded by the LD22, it remains a very capable light with decent (though not class-leading) performance and a wide range of outputs, making it a highly versatile EDC or outdoor light. I've always preferred 2-AA flashlights over other form factors and power systems. 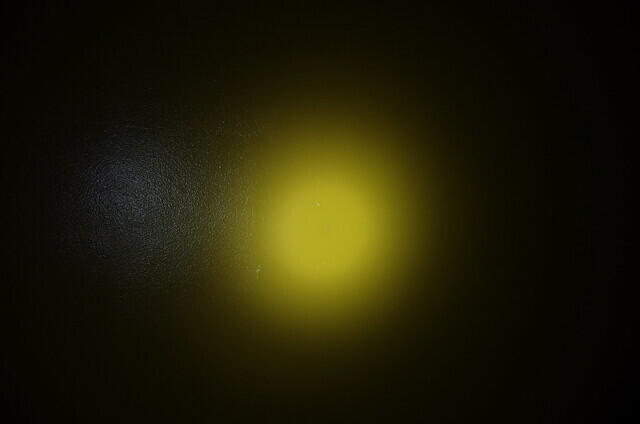 These lights offer moderately high output sufficient for most personal and emergency applications as well as light tactical use, and while they generally aren't enough for the most demanding applications, they allow the use of a battery type found practically everywhere and avoids the hassles and expense of lithium/lithium-ion batteries. They're also well-sized for EDC (though a bit large for some) with more power than 1-AA or AAA flashlights and are fairly lightweight. I bought my LD20 in August 2011 as my first foray into high-end flashlights. While I haven't purchased any more lights since, I am planning on getting a 1-AA light, probably a Fenix E11, as a backup light that I can always keep in my handbag. Pentax K-5 with Pentax DA 18-135mm lens @ 135mm. M, 1/125s f/9 ISO 80. Cropped in Aviary. The version of the Fenix LD20 I am reviewing uses an R5-bin Cree XP-G emitter and is rated to a maximum of 180 lumens per the ANSI FL1 standard. 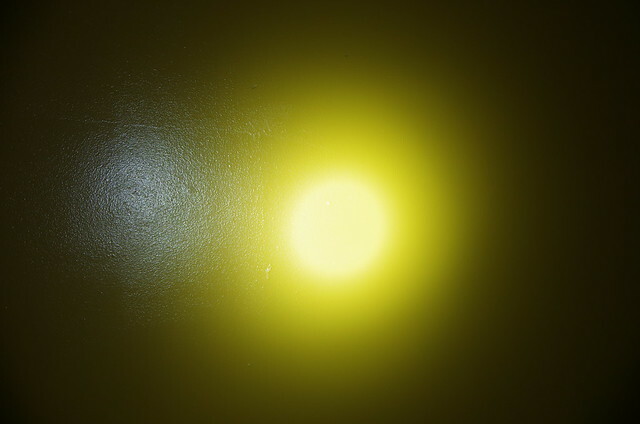 The light uses a fairly deep smooth parabolic reflector, as opposed to an orange-peel reflector. There are a total of six modes: four continuous modes and two flashing modes (strobe and SOS). The four constant-output modes are at 5, 30, 81, and 180 lumens, respectively named Low, Medium, High, and Turbo. 5 lumens is rather high for the lowest output and isn't ideal for situations like nighttime reading, but it's not too bad for most uses. I'll discuss the user interface in more detail later in this review. The strobe runs at the full 180 lumens, while SOS is at 81 lumens, probably to allow for longer runtime. All brightness levels are current-regulated, so there is no flickering associated with PWM. 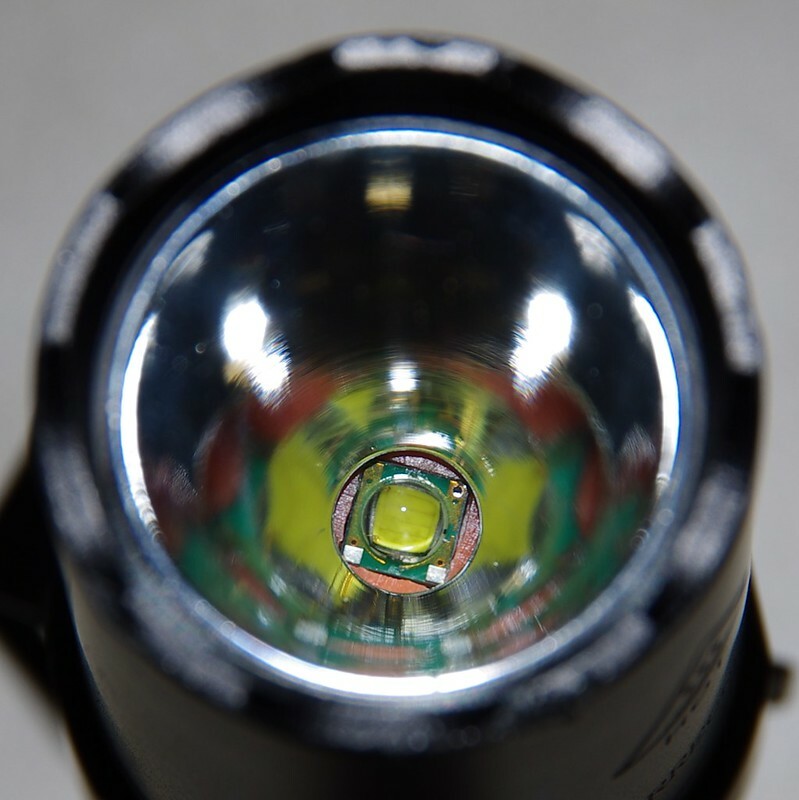 In strobe mode, the light flashes at about 14.2 Hz; this result is based on an audio recording of the sound generated by a flash unit firing in optical slave mode when triggered by the flashlight (a clever way to use a camera flash, huh? ). The LD20 is designed to accept NiMH and alkaline AA batteries, and can be used with lithium primary cells but not 14500 rechargeable lithium-ion batteries. On 2500 mAh NiMH batteries, runtime is specified at 2h 16m at Turbo, 5h 57m at High, 15h at Medium, and 100h at Low. I've tested the light myself and got about two hours at Turbo using 2000 mAh Eneloop batteries, which is consistent with the claimed runtime. (My multimeter indicates that the light draws just over 1.0 amps from fully charged Eneloops at Turbo, or about 3 watts.) I haven't had a chance to formally test runtime on any of the other modes, though experience shows that the claimed figures seem to be accurate overall. It is important to note that the low (and possibly medium) modes will be brighter than expected at voltages above 2.95 or so, as the circuitry is tuned for NiMH batteries and is of the boost type, meaning that it can only increase the voltage from the batteries reaching the emitter and not decrease it. This means that new or mostly new alkaline and lithium primary batteries will not allow the flashlight to properly run at low (or medium). Regulation is excellent, with output remaining constant at the selected mode until the batteries are unable to supply the current required to maintain the selected output level.  When this happens, the light drops to the next highest mode sustainable by the batteries, progressively as the batteries discharge, until the point Low cannot be sustained, at which the light drops out of regulation and runs in candlelight mode until the batteries are completely depleted. 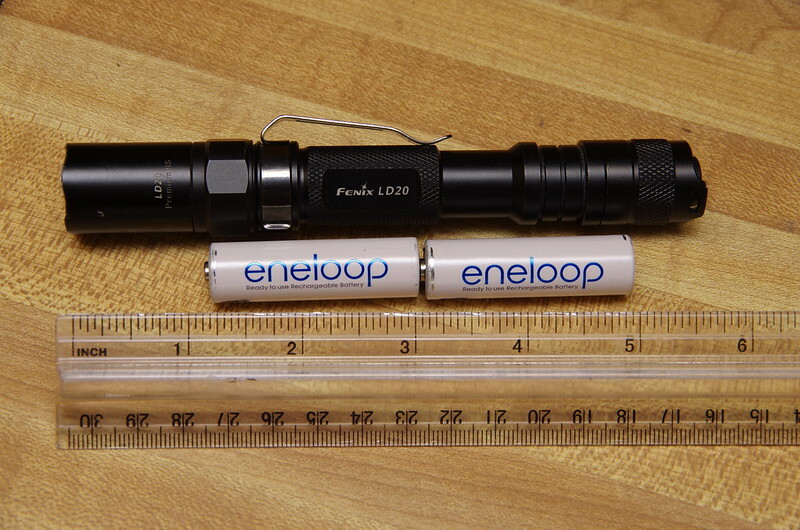 On Eneloops, this drop-off is very rapid as the batteries near exhaustion; on alkaline batteries, the light drops from the highest modes rather quickly but continues to operate at the lower modes for a considerable amount of time. The beam profile is well-balanced between throw and flood, with a moderately-sized hotspot and corona and a large, evenly-lit spill. The beam has minimal artifacts which are of no practical significance during use. Color temperature is cool at about 6400K with a slightly greenish tint as measured by my camera. 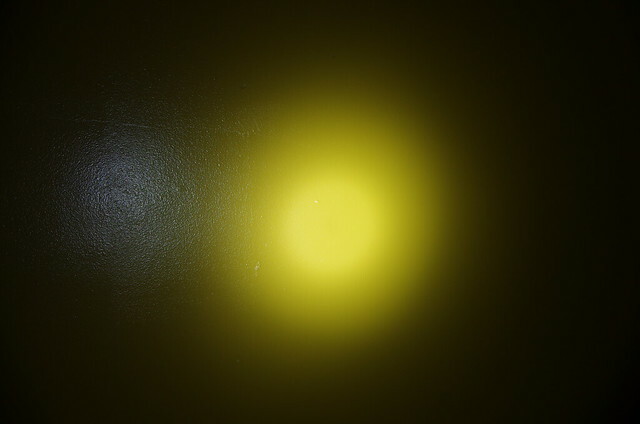 The following beamshots show the quality of the beam and the differences in output at each of the four modes. All beamshot photos: Pentax K-5 with Pentax DA 18-135mm lens @ 36mm. M, 1/25s f/5.6 ISO 200. As mentioned before, the Fenix LD20 has a total of six modes. These modes are placed into two groups and accessed based on whether the head is fully screwed into the body. You press on the tailcap switch (which is a reverse clicky) fully to turn on the light, and cycle through the modes in each group by briefly pressing the switch partially (far enough to "turn off" the light momentarily, but not so far as to click the switch, similar to pressing a camera's shutter button halfway). When the head is fully tightened, two modes are available: Turbo and Strobe, cycling in that order. When the head is loosened, the other four modes are available: Low, Medium, High, and SOS, cycling in that order. This is a well-designed interface and allows for fairly easy access to all of the modes, but is less-suited for heavy tactical use since the tailcap is a reverse clicky switch. Note that there is no memory for the mode last used. Pentax K-5 with Pentax DA 18-135mm lens @ 53mm. Av, 1/100s f/8 ISO 80. The LD20 is constructed primarily of type-III hard-anodized aluminum. The window (lens) of the light is made of impact-resistant tempered glass and has anti-reflective coatings, while the head ends in shallow crenelations. The battery contact at the head is designed to prevent damage due to reverse installation of batteries. The tailcap is designed to allow tailstanding, but does not hold up very well and the light can fall down if the surface isn't level or stable. 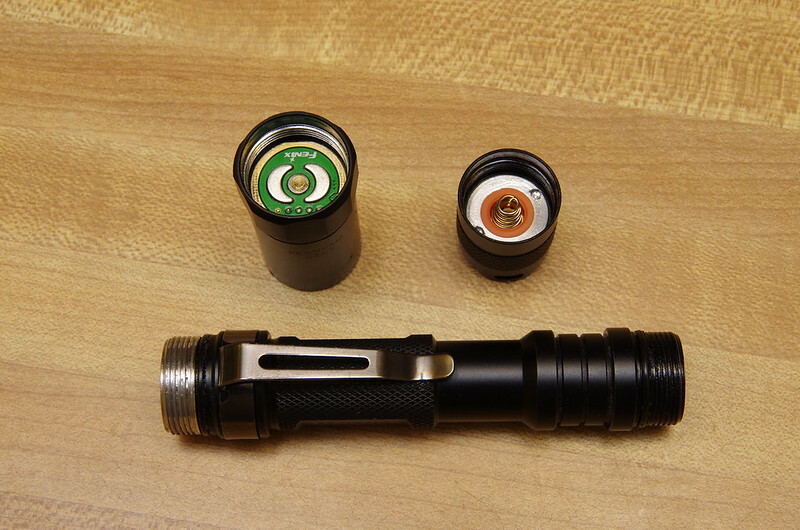 The head threads are conductive, but the tailcap threads are anodized, allowing the light to be locked out against accidental activation by not fully tightening the tailcap. The light is rated to sustain impacts equivalent to 1.5-meter drops onto concrete and is submersible to 2 meters per the ANSI FL1 standard. In practice, the build quality of the Fenix LD20 is very good and proves to be consistent with its rated impact resistance. I've dropped my LD20 onto concrete sidewalks and asphalt from about 4-5 feet at least three or four times while turned on and the light continues to operate reliably and without any problems. The light has a titanium-coated steel clip which is oriented so that the emitter faces up when clipped to a pocket; this clip cannot be reversed. Accessories supplied with the LD20 include a lanyard, belt holster, two replacement o-rings, and a replacement rubber switch boot, as well as a manual and warranty card. Pentax K-5 with Pentax DA 18-135mm lens @ 48mm. Av, 1/100s f/14 ISO 320. Overall, the Fenix LD20 works as promised, and although it is now discontinued in favor of the LD22, it delivered solid performance for the money (at US$60 at the time). While there are better and more powerful lights in the same class today (such as the FourSevens Quark Pro QP2A-X), the LD20 offered, at least for its day, a competitive combination of performance, versatility, and reliability. It holds up to intense usage well, and it shows that Fenix is able to build high-quality lights at prices that make sense. In conclusion, the LD20 is a very good EDC light. I'll be choosing Fenix for my next light. Last edited by DragonLord; 01-04-2013 at 03:21 PM.